February is Teen Dating Violence Awareness Month. According to breakthecycle.org, one in three teenagers reports knowing a friend or peer who has been hit, punched, kicked, slapped, choked, or physically hurt by their partner. For the last six years, the Teen Dating Violence Summit has brought valuable information and resources to teenagers in Prince George’s County. I am inviting students ages 13-21 to create a piece of visual art or poets to create a written piece depicting self-love. Contestants email Carlotta.Wade@pgparks.com with a photo of your work and the date you intend to bring it to the Central Area Office at Watkins Park. Submissions are tasteful with no derogatory images, implications, or language. Participants invite family and friends to come out and vote. Submissions are tasteful since the link will be downloaded to our Xtreme Teens social media sites. 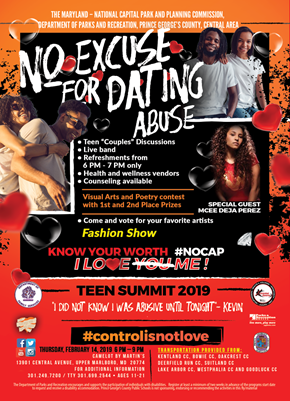 The winners of the contest will be chosen during the “No Excuse for Dating Abuse: Teen Dating Violence Prevention Awareness Program”, on Thursday, February 14, 2019.